Financial empowerment coach Beth Burns knows that many women are behind the curve when it comes to understanding financial basics such as budgeting, retirement planning and investing. 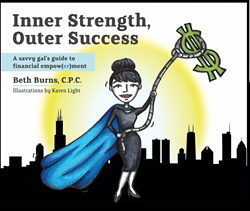 Beth Burns wants to help women understand financial basics with her new book: Inner Strength, Outer Success: A savvy gal’s guide to financial empow(er)ment. When people have a better relationship with money they, in turn, can accomplish their goals. I work with people to determine what their goals are and how are they are saving to meet them. Financial empowerment coach Beth Burns knows that many women are behind the curve when it comes to understanding financial basics such as budgeting, retirement planning and investing. She wants to change that situation for women with her new book: Inner Strength, Outer Success: A savvy gal’s guide to financial empow(er)ment. Those personal experiences became the foundation for her new book. Burns guides women to first establish rewarding goals then subsequently how they can pay themselves first, establish a budget, differentiate between wealth versus stuff and then she shares investment terminology. The ultimate message Burns wants for her readers is to become better stewards of their money. Beth is a national speaker, certified professional coach (c.p.c), the founder of the (er) factor, and the author of Inner Strength, Outer Success and her new book Inner Strength, Outer Success: A savvy gal’s guide to financial empow(er)ment. She has a B.S. in engineering from Michigan State University and an M.B.A. from the University of Chicago. Beth is also a successful investment management professional, with over 25 years experience in the capital markets including mergers & acquisitions, portfolio management, investor relations, and investment management consulting. With over 30 years of corporate experience, Beth has worked with seven different organizations ranging from large fortune 500 companies to small 30 person firms. In addition to her extensive career, Beth has navigated herself financially through two periods of unemployment. In this book, Beth highlights her financial successes and pitfalls to share with women strategies to be more financially empow(er)ed. Beth is pursuing her passion, to inspire others to be happi(er) and more financially empow(er)ed. For more information, visit http://www.innerstrengthoutersuccess.com.